Just been to Redstar track East of Johannesburg to test drive the 4th Generation Renault Megane hatch at launch. The Megane comes with an updated, impressive array of improvements in tech, style & looks. It also has the 4 Control 4 wheel drive capability last launched in The Laguna, which did not catch on at the time. Based squarely in the highly competitive C segment, up against the likes of the Golf GTI, Focus ST & Honda Civic Type R, it has always been a contender, without actually being in the top echelon. The styling is distinctive with teardrop styled LED lamps, and the rear brake lights having a long rake. The Megane although marginally longer, sits low to the ground and seems wider than it actually is, which gives it a suitably aggressive silhouette. The new interior definitely gives an air of quality and refinement, as well as a level of solididity. Wrap-around and contoured front seats ooze comfort and back support and the dashboard lines(also wraparound) extend to the front doors. 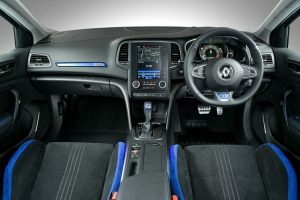 A high and wide centre console has attractively moulded strips and the fine detail surrounding the rev counter, air vents and full-grain leather steering (GT and GT-LINE models only) and other areas, is in satin-finish chromium. Space has been optimised and provides more shoulder room and abundant leg room. 4CONTROL and driving aids for example. Complete with a new 7” horizontal touchscreen & voice recognition for the navigation system, which is great when driving. In the top models a 8.7” screen helps with various drive modes such as Sport ( GT only), Eco(GT Line), Normal, Comfort & Personal– by which you can adjust multiple facets (engine noise, chassis setup and gearbox setting) to your exact liking. The top-spec GT derivative also comes with a 4-wheel steering system. Renault has introduced this feature before – on the Laguna Coupe some 6 years ago but it never really took off. 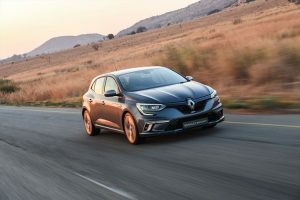 On the Megane, the system makes the hatchback more manoeuvrable at low speeds, helping to turn the car sharper and then keep the car stable at freeway speeds. 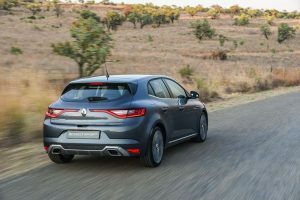 Other neat additions to the Megane include optional self-parking for parallel or alley docking parking, optional blind spot monitoring and a standard heated driver’s seat. The Megane also has a 5-star EuroNCAP safety rating. No turbo-diesel in the range, and Renault have opted for an all petrol lineup. Surprisingly, probably price related is a lone naturally aspirated 1.6-litre unit producing 84kw & 156 NM of torque. The first of the turbopetrol engines is a 1.2-litre unit, which has been carried over from the previous Megane. It delivers 97 kW and 205 Nm and is available with either a 6-speed manual or 7-speed dual-clutch automatic transmission. This variant had sufficient grunt at the Highveld altitude and we found it was a smooth drive.. The top-spec engine currently is the 1.6-litre turbopetrol motor. It’s carried over from the Clio RS, but offers more power and torque (151 kW and 280 Nm) and the updated, better-calibrated 7-speed dual clutch transmission. This variant had some go, and will probably be the firm favourite of the petrolheads. I was unable to drive the Megane on the track so cannot report on that now. I will provide more feedback after a 7 day test. With plenty of spec the Megane appears to be competitively priced in this hotly contested segment. The engine line up and transmissions are built on Renault F1 experience and cannot be ignored. The GT model might be a little close to its highly regarded competitors like Golf, but offers performance and a fun factor. plan. Services take place at 15 000 km intervals (10 000km on Megane GT). To sum up, the Megane should excite a loyal following, as it is well spec and is well appointed. 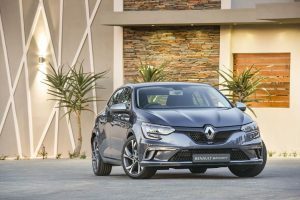 The drive delivers in most aspects, and it will represent Renault well in the hotly contested C segment.